FOUR MONTHS after Ukraine's president traveled to Washington to plead for lethal military aid in its fight against Russian-sponsored violence and treachery, the US government is finally taking his entreaty seriously. 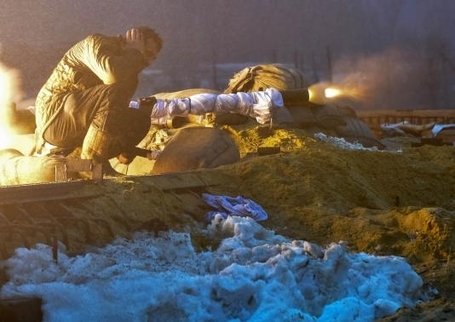 A Ukrainian soldier fights Kremlin-backed separatists in Pesky village, near Donetsk, January 21, 2015. Russia has sent thousands of troops, along with tanks, heavy artillery and armored vehicles, to support the rebels in eastern Ukraine. The New York Times reports that "an array of administration and military officials" are leaning toward providing defensive weapons to Kiev's struggling armed forces, a step the White House has so far rejected. According to the Times, those in favor of arming Ukraine now include Defense Secretary Chuck Hagel and NATO's military commander, US Air Force General Philip Breedlove. Secretary of State John Kerry and the chairman of the Joint Chiefs of Staff are reportedly "open" to the idea. Even National Security Adviser Susan Rice, long opposed to supplying lethal assistance, is now prepared to reconsider. Judging from a CNN interview broadcast on Sunday, the president still insists that diplomatic and economic support for Ukraine is as far as he's prepared to go. He acknowledges that sanctions and diplomacy have not deterred Vladimir Putin from inflicting a bloody separatist war on Ukraine. But "to those who would suggest that we need to do more," Obama said, "I don't think that it would be wise ... to see actual military conflict between the United States and Russia." Does the president really believe that sending defensive military aid to Kiev is tantamount to military conflict with Russia? He has repeatedly said he would consider all options for putting pressure on Moscow "short of military confrontation." But Ukrainians are not asking the Americans or NATO to fight their battles; they are asking only for the means to lawfully protect their territory against an enemy that will stop at nothing in its bid to destroy Ukraine's territorial integrity. Washington's refusal to furnish Ukraine with anti-tank and anti-aircraft weapons hasn't encouraged Russia to stand down, but to press forward, escalating the fight against its democratic neighbor with increasingly deadly results: more than 5,000 people dead, more than 500,000 made homeless. "The aggression against Ukraine has become one of the worst setbacks for the cause of democracy in the world in years," Ukrainian President Petro Poroshenko, told a joint session of Congress in September. The Moscow-backed assault on Ukraine's stability and sovereignty threatened global security everywhere, he warned, and the Ukrainian army — "underequipped, and often unappreciated" — was desperately trying to forestall the nightmare that a Russian victory would mean for all of Europe. To do so, it needed weaponry, Poroshenko stressed. While Ukraine appreciated nonlethal assistance, such as blankets and night-vision goggles, "one cannot win a war with blankets." "Give us the tools, and we will finish the job" — Winston Churchill implored America in 1941 to send England the weapons it needed for its defense. Everyone understands what Russia is aiming at. "We have seen this playbook before," Samantha Power, the US ambassador to the UN, said in the Security Council last month. "Before eastern Ukraine, we saw it in Crimea. And before Crimea, we saw it in the Georgian regions of Abkhazia and South Ossetia. Before Georgia, in Transnistria. The endgame in all of these Moscow-manufactured crises has been identical: to gobble up parts of neighboring countries." Putin's goal is not in doubt. There should be no doubt about our response. 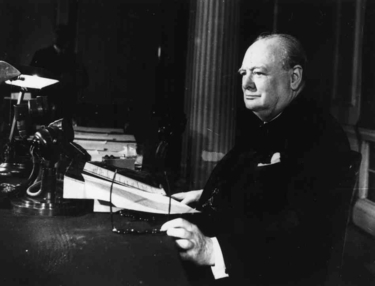 In a speech broadcast from London 74 years ago this month, Winston Churchill implored the United States to supply the weapons that England needed to defend itself from Nazi Germany. "Give us the tools, and we will finish the job," Churchill asked. Ukraine is asking for no more — only the tools to defend itself. Already we have delayed too long, and too many victims have died.